My career as a reporter spanned a remarkable time in local TV news, of both incredible journalistic creativity and commitment, and a profit-driven abandonment of journalism's civic responsibility to keep the public reasonably well-informed. In the past couple decades, even as the number of news providers has exploded, the content from most of those providers has grown thinner as news staffs have been dramatically reduced, and it has grown more vapid, an ever-more dumbed-down pandering to anything that might get the most attention, regardless of whether the information tells people anything they need to know, or want to know, that might actually be of use in their lives. This retreat from the implicit promise of any news organization to help keep the public reasonably well informed, by shrinking staffs and content and re-defining 'news' as "whatever people are talking about around the water cooler," is the result of a new media marketplace in which there are many more competitors, so the pie of available listeners/readers/viewers is sliced into more, and thus much thinner, pieces. Profits drop (in the '80s, TV stations made a stunning 30-40 percent operating profit, newspapers an incredible 15-25 percent!) 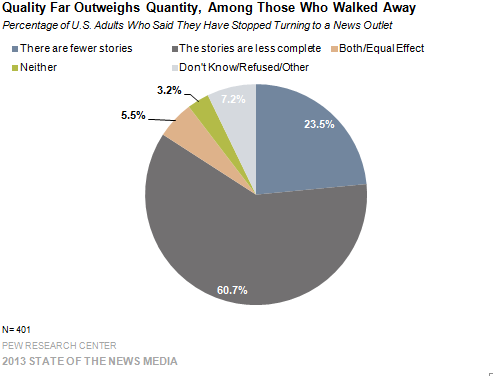 which leads to staff reductions, which lead to fewer and shorter/shallower stories. And the explosion of news media providers has turned the information marketplace into a 24/7 scream-a-thon in which newsrooms have to work harder and harder to attract viewers or readers, which leads to content that is more and more noise rather than news. What's really amazing is how the supposedly smart people who run the news business don't realize that by reducing their staffs and dumbing down their content, they are shooting themselves in the head. A recent survey of American's news consumption confirms the self-defeating ignorance of abandoning news content in pursuit of news consumers. Nearly one-third -- 31 percent -- of people say they have deserted a particular news outlet because it no longer provides the news and information they had grown accustomed to. Do you hear that, newspaper publishers and TV station managers and online newsroom owners? Less news = smaller audience = less profit. And 'less news' doesn't just mean fewer stories. The majority of those lost readers and viewers left not because there were fewer stories, but because the stories that did make the news had less news in them. The Pew survey is both bad news, and good news, for the news industry. It casts a harsh light on the ultimately self-destructive way that the legacy 'Old Media" news operations are trying to reinvent themselves. But to be fair, the 31 percent of news consumers who expected more from their news provider and left when they stopped getting it were largely older, whiter and richer. It may well be that a 300-word story leaves a 60-year-old wondering where the rest of the information is, but satisfies a 30-year-old. Consumer expectations depend on which news consumer/demographic we're talking about. They're not all the same. It may also be that quick shallow stories are less a problem for younger readers who are used to searching/clicking around for their news rather than getting it all in one place. As Matthew Yglesias rightly points out in "The Glory Days of American Journalism", the availability of information, including in-depth information, has never been greater. But even for local TV news, the Pew survey can be taken as good news, or at least good advice for news providers. It suggests that across the entire population there remains a market for news, a public hunger for information about what's going on out there in the world that is not only interesting but also relevant and useful, and reasonably thorough. The news organizations that figure out how to fulfill that hunger can prosper, each within the realities of their own medium and area of focus, of course. Those that follow the path of shrinking the news content down, and dumbing it down - no matter whether they are TV, newspaper, online, or a combination - will face the frustrated judgment of the market which was well-summed up by Bruce Springsteen in "57 channels (and nothin' on)"? "Fifty-seven channels and nothin' on."